Mid-Continent Instruments and Avionics introduced an advanced, 2- x 5-inch standby display at the NBAA Meeting and Convention in Orlando, FL. 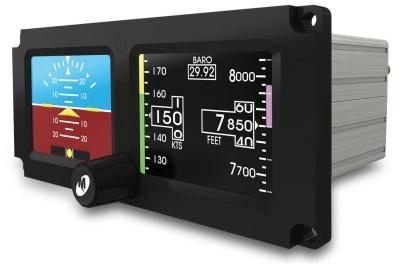 The MD302 Standby Attitude Module (SAM) is an entirely self-contained, solid-state instrument that provides attitude, altitude, airspeed and slip information to the pilot during normal operation or in the case of primary instrument failure. The MD302 Standby Attitude Module is designed to interface seamlessly with most primary avionics systems and is capable of synchronizing data, such as barometric pressures from standard ARINC outputs. Designed, certified and manufactured in Wichita, KS, list price is $10,600 and includes a 2-year limited warranty. SAM is pending Technical Standard Order (TSO) certification to C2d, C3e, C4c, C10b, C106 and C179a, including RTCA DO-178B and DO-254 Design Assurance Level A. TSO certification is expected later this year. Mid-Continent Instruments and Avionics is working to receive Approved Model List (AML) Supplemental Type Certificate (STC) for FAR Part 23 aircraft that includes more than 500 different models. Aircraft-specific Part 25, Part 27 and Part 29 STC certifications to follow.